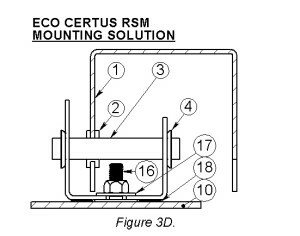 The modular frame is the basic component of the ECO CERTUS system (Figure 2). The main component of the modular frame is hat-profile. 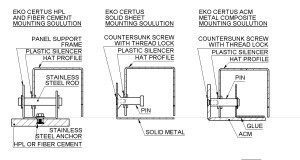 The hat-profile has hook-like cuts for pin-type fixing of the cladding panel. Before assembling, the pin and the hat-profile contact surface is sealed with the plastic silencer. The profile is attached to a building’s load bearing partition wall or structures using special compatible brackets and adapters. Along with securing the profile, the adapters also precisely connect one profile to another. Frame components are available in aluminum, galvanized or stainless steel. The available machinery equipment enables the production of the main supporting frames, brackets, etc. in custom sizes according to dimensions measured at the building site. It helps to reduce the waste of material. Also there is a possibility to powdercoat the modular frame in predefined color from RAL palette. SMART FLEX support frame system is specifically designed to accommodate thermal or other moisture inflicted cladding panel size deflections against the metal frame. ECO CERTUS is designed for HPL, cement fiber, metal sheet or composite, stone cladding. ECO CERTUS system fulfills the ultimate architect’s requirements for the system precision, tolerances and exclusive looks. All parts which are mounted during the assembly process are made of materials which are safe from corroding. Also individually fabricated steel parts are galvanized.